Jaguar Land Rover announced Tuesday it is testing a pothole-detecting sensor with a cybernetic eye towards crowdsourcing information about the suspension-bashing nuisances. The automaker’s concept would have a series of connected cars sharing pothole data with each other so fellow drivers could avoid pothole-heavy areas or the car itself could tweak a suspension to minimize damage. Jaguar said it achieves the latter by activating a magnetic field that affects particles inside the suspension, changing the viscosity of the damper fluid. The data would also be sent to a cloud to provide free road condition research to public works and transportation agencies (who at least in America will ignore them because of budget cuts). Sensors tested in the Range Rover Evoque and Discovery Sport seem to be working, according to Jaguar, but the vehicles have to drive over the potholes to get the data. (Good luck getting volunteers.) 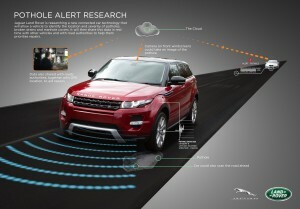 Jaguar now plans to install front-facing stereo digital camera in a Range Rover Evoque to try and see the holes early. “At the moment the most accurate data comes from when the car has driven over the pothole or manhole,” Jaguar global connected car director Mike Bell said in a statement. “So we are also researching how we could improve the measurement and accuracy of pothole detection by scanning the road ahead, so the car could predict how severe they are before the vehicle gets near them. The Coventry, England, City Council will get a taste of the data produced by the sensors so that Jaguar can understand what a local government would like to know about its roads and a method of delivering such data. Unfortunately for the auto repair industry — both collision and automotive service — this seems yet another piece of realistic technology that could impact business. However, potholes are going to return or lay unfilled for months, and drivers (or self-driving cars) don’t always have the option of avoiding them. And there’s likely to be at least a partial recoup of lost business through more expensive sensors raising repair costs.